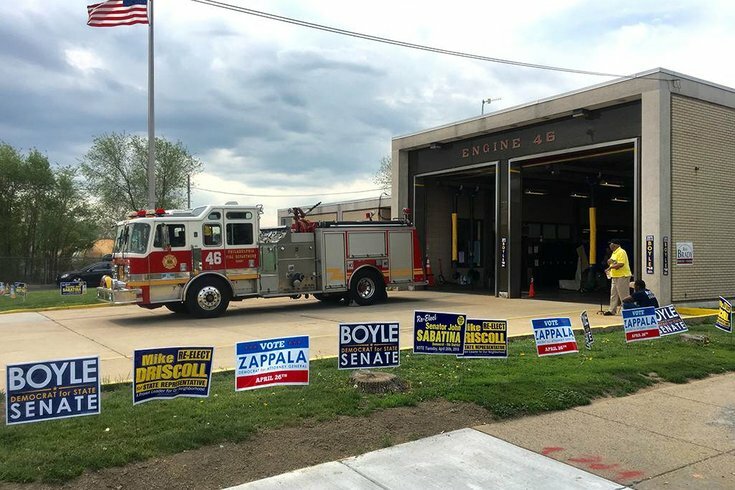 During the 2016 primary election in Pennsylvania, campaign signs line the driveway at the Engine 46 firehouse polling location at Frankford and Linden avenues in Northeast Philadelphia. With the SEPTA strike in its fourth day, and no end in sight, a group of labor unions in town are making plans to get people to the polls if there is no settlement by Election Day. The Philadelphia Building and Construction Trades Council (PBCTC) — and all of its business managers — announced Friday that “voter vans” will ease trips to polling places. On Nov. 1, members of Transit Workers Union Local 234 hit the picket lines, idling the SEPTA buses, subways and most trolleys. As of late Friday morning, no deal has yet been reached to get them running again. If the strike continues through Tuesday, members of the Philadelphia Building Trades will be operating vans to shuttle voters to their polling places to ensure all Philadelphians are able to vote. In the statement, Dougherty noted that although the "Philadelphia Building Trades formally endorsed Democrat Hillary Clinton for President, the 'Voter Vans' initiative is a non-partisan effort and drivers will not attempt to influence passengers’ voting decisions." According to union spokesman Frank Keel, the plan is not yet finalized, and hotline numbers aren't yet available. In an interview Friday morning, Keel said the plan is to have several hotline numbers available — one for each area of the city — for voters to call in order to obtain a ride. Keel said the initiative is being organized Friday and, the council hopes to have a tally of how many vans will be available — and publish the hotline numbers — by the end of the day. What would be best, Keel said, is an agreement reached before Tuesday by SEPTA and its transit workers. "Hopefully, they can get this thing settled by the end of the day," he said. This is a breaking news story and will be updated as more information is made available.